Maryland Drivers Alliance: Resolve to Fight Scameras in the New Year! 1) The creation of vast numbers of new school zones solely for the purpose of adding 'school zone' speed cameras, many not adjacent to any school. 2) A Baltimore City speed camera issuing hundreds of tickets in error after being set to the wrong speed limit. 3) The systematically failure to perform daily calibration tests, required by law, by both Gaithersburg and Montgomery County. 4) It was discovered that Gaithersburg had placed one camera at a location where the SHA concluded the speed limit was set 10mph to low according to accepted traffic engineering standards. When confronted with this and the SHA's request to lower the speed limit, the city responded by demanding that the reduced speed zone instead be enlarged. 5) Some local governments wrote huge amounts of revenue into their FY11 budgets from speed cameras. Cheverly in particular wrote $2.8million in 'fines and forfeitures' or 36% of the entire budget, after lowering the default speed limit in the town by 5mph. Forest Heights also wrote $2.8million in speed camera fines into their FY11 budget, an amount larger than their entire FY10 budget. 6) The speed limits at camera sites on US Route 1 in Brentwood and Mount Rainier were discovered to have been lowered by 10mph shortly before the town added the cameras. 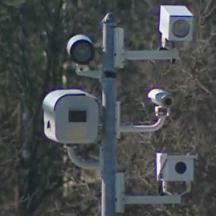 The cameras are enforcing a 25mph speed limit in a location which had been posted at 35mph for years prior. A similar situation later appeared in College Park, where the city DPW altered speed limit signs on Metzerott Road to enable a speed camera to enforce a 30mph speed limit in a location which was previously marked as 40mph. The change was made the same month the camera started issuing tickets. 7) Questions were raised about the accuracy of cameras in Brentwood and Forest Heights. The 'investigation' (if any) was conducted only by the contractor, who has a financial stake in finding no problem. 8) Forest Heights failed to provide court hearings in a timely manner to ticket recipients who requested them. The defendants were not sent court dates for a period of well over 3 months, during which time the drivers were sent notices that their registrations would be suspended if they did not pay, seemingly trying to coerce them into paying rather than exercising their right to contest the tickets and risk additional penalties for driving with a suspended registration. 9) One driver confirmed receiving a ticket from Brentwood when he had never even been to the town. The ticket was for another model of car, showing that meaningful human review of tickets often does not take place. 10) Montgomery County tries to assert that drivers do NOT have the right to confront the speed camera operator in court, obliterating what little right to face your accuser you had left. And this is only what could be described as the 'low hanging fruit'... the facts that could be easily uncovered in open sources and public documents. The FULL truth is likely to be much worse, particularly since some local governments have been deliberately withholding records. Prince George's County stonewalled information requests under the Maryland Public Information Act for information pertaining to new school zones and new camera sites, in clear violation of state law. Forest Heights has denied access to ALL records pertaining to possible camera errors, both to StopBigBrotherMD.org and defendants in speed camera cases. And Brentwood has even refused to acknowledge the MPIA requests, in clear violation of state law. The next Maryland General Assembly will be in session from January 13th through April 12th. This is the 3 months out of each year when state lawmakers get the chance to screw with your life. Camera contractors are running well funded lobbying efforts, as well as PR campaigns targeting media outlets supported by taxpayer funds. Those campaigns will state that the programs are about safety and not revenue when the facts speak differently: Montgomery County saw a huge increase in traffic fatalities in the first half of 2010 at the same time new cameras were being gradually added and an unlimited number of new cameras were authorized, and at the same time the national traffic fatalities were substantially dropping. Unfortunately, most of the lawmakers who voted for statewide speed cameras are still there and are feeling very secure It is absolutely guaranteed that lawmakers will be considering bills to remove restrictions from speed cameras, raise fines, authorize new types of photo enforcement, and further degrade your legal rights to due process. This will continue the process of placing drivers at the mercy of whatever local government is the least competent or most corrupt. It allows cash-hungry local governments to engage in "legalized fraud" to extract revenue from out of town drivers, who may believe they were driving in a perfectly safe manner but cannot vote in local elections and live too far away to challenge tickets received weeks later. Now is the time to write to your state lawmakers, whom you can locate here, and tell them that you oppose photo enforcement and believe there should be MORE restrictions on photo enforcement, not less. Resolve in 2011 to take action to stop scameras.